Mrs Garbutt has now retired from running Breakfast Club which she has done for many years. We would like to thank her for all her hard work. Mrs Abdul will now be coordinating Breakfast Club. Thursday 28th September Non – uniform day / coffee morning for parents – contributions towards Macmillan Cancer Appeal. INSET – Friday 29th September so school closed to children. 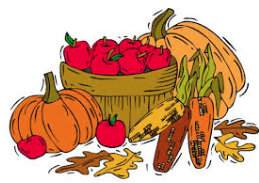 KS2 Harvest Festival – 2.15pm Monday 23rd October. Foundation and KS1 Harvest Festival – 9.30am Tuesday 24th October. Nearer the time we would welcome contributions of tins, boxes and packets (no fresh produce thank you) which will be given to the Rush House. Halloween disco – 3 – 4.30pm Thursday 26th October Y1 to Y6. Break up for half term – Friday 27th October. Start back – Monday 6th November.